These tools are used for sizing cuts on spindles, rolling beads, and can be used as a small negative rake scraper. 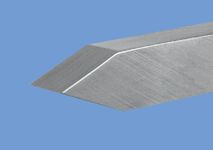 We offer tools that measure 1/4" sq. or 3/8" sq. by 6" long with a 10" handle.